slight paranoia: Do we need net neutrality at 35,000ft? Do we need net neutrality at 35,000ft? Gogo Inflight Internet Wireless is the sole provider of in-flight Wi-Fi in the United States -- and is already installed aboard planes in the domestic fleets of Delta, American and Virgin America. While their service is awesome -- their pricing plans currently involve some fairly horribly discriminatory pricing. "Mobile" devices including iPhones, Nokia handsets and various Windows Mobile devices pay $7.95 for flights of any length, whereas laptops pay $9.95 or $12.95 based on the length of the flight. Metered pricing is currently a hot topic in telecom circles, primarily due to the fact that the carriers want to be able to gouge extract as much of a profit out of their customers as possible. Gogo does not implement metered pricing. iPhones and laptops are provided with the same amount of bandwidth, and as far as I can tell, neither receives priority over the other. There are no bandwidth caps, nor any additional charges for using too much data during a single flight. Gogo simply wants to be able to charge its customers more money for watching a YouTube video on a laptop screen than an iPhone -- even though that laptop does not put any more of a burden on Gogo's network than the iPhone. This is unfair, unreasonable, and frankly, something that the FCC should look into and prohibit. Luckily, Gogo doesn't have any verifiable way to identify the kind of device a customer is using, and so it has opted to rely upon the self-reported User Agent string transmitted by the on-device Web browser. This browser string is something under the control of the user (at least those a little bit tech savvy), and by manipulating this information, it is possible to connect a laptop to the Gogo Inflight Internet Wireless system for the cheaper $7.95 price normally restricted to mobile devices. Best of all, if combined with a discount coupon (easily found online), this price can be reduced further, to a quite reasonable $3.95 for a 5+ hour flight. Gogo's acceptable use policy requires that consumers not use the service in order to "engage in any fraud or misrepresentation." As a result, the following information is provided for purely educational purposes as an act of communications policy related activism. Do not follow these steps without first consulting with a lawyer. Step 1. Download and install the User Agent Switcher Firefox add-on (this needs to be done before your flight). Step 3. 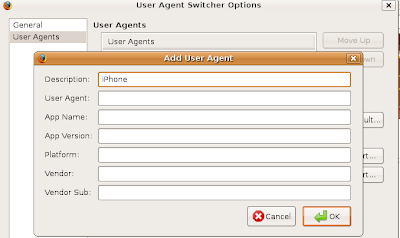 Select the Tools-> User Agent Switcher -> Options -> Options menu. Step 4. Select the User Agents tab, and then click on the "Add" button to create a new user agent. Step 5. In the "Description" field, type in "iPhone"
Step 6. Now that you have added the new user agent, you have to tell the browser to start using it. Do so by going to Tools -> User Agent Switcher, and then select the new iPhone option. Step 7. Once you are on board a Gogo enabled flight, wait till the plane is above 10,000 ft, and connect to the open gogoinflight wireless access point. Step 8. Type in any web site address. You will be redirected to the Gogo portal, and will be prompted to pay for wireless access. Step 9. You should see a $7.95 option for mobile Internet access for your flight. Should you wish to save a few more bucks, Gogo seems to regularly offer discount codes, further bringing the price down. Step 10. After you have paid for the service, and are connected to the Internet, you can switch the user-agent string back to the default Firefox setting. They want to implement tiered pricing. This allows to maximize the number of paying customers, price discriminate based on demand, etc. But they also believe that mobile devices are simply less likely to be moving as many bits. We know that price discrimination is a) efficient and b) loathed by everyone under certain framings. Moreover, service differentiation is not easy. If the provider does it, it is an extra layer in the router, where different IP's have to be served at different levels of service. And if you charge by the bit, or cap the bits, I think you and I would both agree that the provider needs to give the user a means of measuring his/her traffic. I haven't seen a decent interface that allows users to actually work with a bandwidth cap. So it seems to me that Gogo took a fairly efficient approach. Unencrypted wireless traffic can be sniffed. A man in the middle attack an be used to steal login credentials. Mac address cloning can be used to disrupt others service or provide free service to the cloner. Just waiting for this to happen... someone with two wifi cards purchases the service and hosts a wifi hotspot which giving away wifi for free or undercuts the prices of Gogo. Unfair and unreasonable, perhaps. But why should the government interfere in this transaction? Because we're so accustomed to them managing every aspect of our lives? Because people can't be trusted to evaluate whether an internet connection is worth $12.95 to them? I'm confused why a blogger that generally investigates the inappropriate and overreaching use of government power thinks this is something the government should be doing. I'm not clear on why this is "unfair and unreasonable." I would not be at all suprised to find that people using notebook computers generally do use significantly more bandwidth than people using phones; as I've learned from the Japanese market, this is due as much to different usage patterns as to differing device capabilities. So let's hypothetically say, for the moment, that laptop users do indeed on average move about 60% more bits than mobile device users. Would you still say that the pricing is unfair and discriminatory? Also, would you prefer a non-flat-rate price that would charge for exactly the amount of traffic each individual uses? What if this involved a small price increase to cover the accounting overhead? I would prefer a scheme which charged consumers based on the amount of bandwidth used, vs. one which charged people based on the assumption that one device is more likely to use more bandwidth than another. However, given that Gogo's network essentially has fixed costs (one more Youtube video doesn't cost them more money to serve), I doubt this pricing scheme is needed. They only allow you to connect one device at a time. GoGo limited my bandwidth on a recent flight. I have used my sling box on the last ten flights without any bandwidth issues. Well, GoGo capped me and made my ability to stream useless on their system. After a long debate with a GoGo Rep., they refunded my flight but didn't lift my bandwidth capacity. Nice.